Service rate (SR) is defined as the percentage of eligible cow that are bred every 21 days. SR is equivalent to heatAlso “oestrus”. 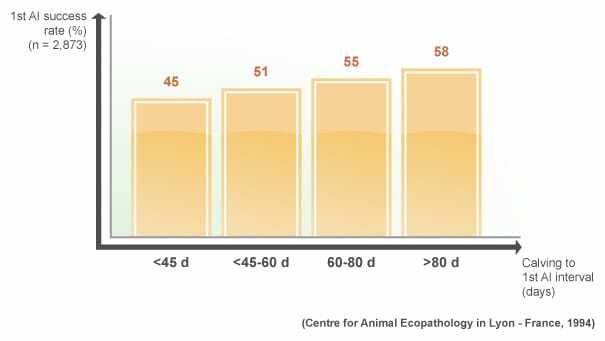 Physiological and behavioural phenomena that precedes and accompanies ovulation in female mammals. detection rate if cows are bred to standing oestrusAlso known as heat, is the physiological and behavioral phenomena which precedes and accompanies ovulation in female mammals..
A simple way to calculate this value is by dividing the length of the reproductive cycle (21d) by the average number of days between inseminations or breeding interval (BI). 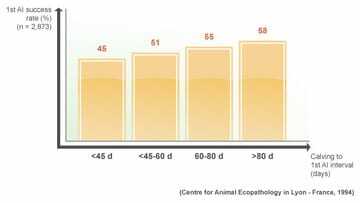 For instance, a herd in which the BI=45 days has approximately an oestrusAlso known as heat, is the physiological and behavioral phenomena which precedes and accompanies ovulation in female mammals. efficiency of 21/45=47%. OestrusAlso known as heat, is the physiological and behavioral phenomena which precedes and accompanies ovulation in female mammals. 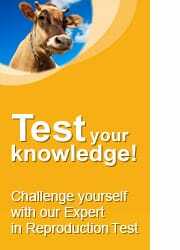 detection rate or service rate is recommended to be above 60% to keep an adequate calvingGiving birth to a calf. interval in the herd. Conception rate (CR) is the percentage of cows that conceive after a breeding. Some specialists use the term pregnancy-per-insemination (P/AI) to refer to this reproductive parameter. 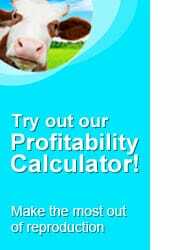 A simple way to calculate the CR is count the pregnant cows out of the inseminated ones within 21 days. Conception rates in dairy herds are expected to be around 30 to 40%. 21 day pregnancy rate (21d-PR) is a combination of the last two parameters. In other words, it is the proportion of eligible cows that become pregnant every 21 days. Another option is to simply multiply the SR and CR. Block calvingGiving birth to a calf. dairy and beef herds concentrating the inseminations in 3 or 4 months of the year tend to use other parameters. For example, in order to have a balanced breeding season, farmers need to ensure that most of the cows are pregnant before the middle of the breeding season, otherwise too many cows will calve too late in the following year and the breeding season scheme can’t be continued. Thus, an index normally used is the percentage of cows pregnant before the middle of the breeding season, which needs to be above 70% for both beef and dairy herds. CalvingGiving birth to a calf.-to-conception is another reproductive parameter used by many dairy and beef operations. Ideally, calvingGiving birth to a calf.-to-conception should be between 80 to 100 days in order to obtain one calf per cow per year (up to 115 days in large intensive dairy farms with high yielding cows). The first artificial insemination (AI) conception rate is defined as the proportion of cows that become pregnant after a first AI divided by the total number of cows that where inseminated. A success rate of over 50% is adequate (35 to 40% in high yielders), but this may vary depending on a number of issues including the calvingGiving birth to a calf.-to-1st service interval (also known as voluntary waiting period). Animals are culled because of disease, infertility and in order to improve the genetic merit of the herd. A cullingProcess of removing an animal from the breeding stock, on most occasions sending it to be slaughtered. rate due to infertility of 25 to 30% is common. Return to reproduction: not too early, not too late! Cows shouldn’t be inseminated too early postpartum otherwise conception is low. In contrast, they shouldn’t be inseminated too late either because otherwise the calvingGiving birth to a calf.-to-conception interval would be too long.